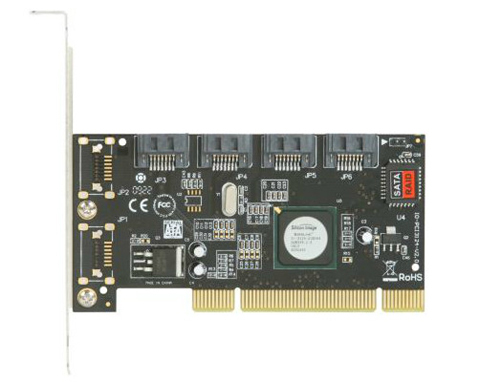 Bring new life to any old desktop PC with the SYBA SY-PCI40010 4 Channels PCI Serial ATA II Raid Host Controller Card. It adds up to four SATA II 3.0Gbps ports to your computer, allowing you to connect up to four hard disk drives to your system. It supports RAID 0, 1, 5, 10, and JBOD for maximum performance and data integrity. Plus, it supports plug-and-play and hot plug functions. •Hardware RAID Array Maximum size: 2.3TB; Except for JBOD mode. •The port# is listed in order. 1.50" x 5.50" x 6.75"
Pros: I can turn on or off at will a docking station while the computer is running up to four e-sata docking stations using 4 e-sata sata cables purchased separately. Cons: It took me a while to fine a Windows 10 driver for this card. Silicon Image SiI 3124 driver. Other Thoughts: Yes I recommand this product. 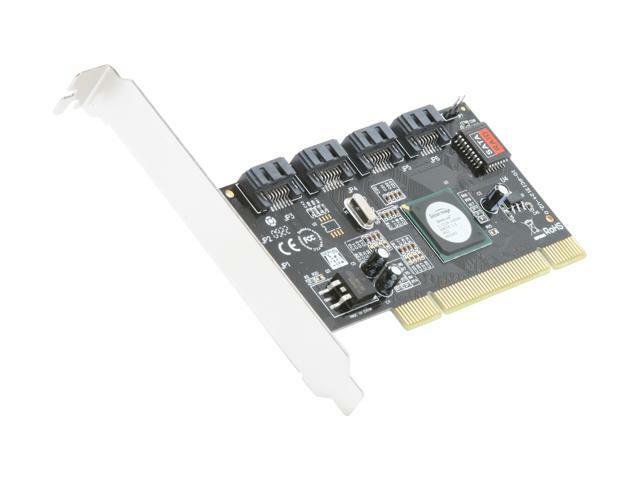 Pros: it's a 4-port PCI SATA card with average performance. Cons: Got the card installed, drives installed and then used card-bios to configure RAID. CentOS clearly shows the three drives separately, not as a RAID device. Some quick reading shows that the Windows drivers are what makes the contents of the card look like a RAID device. The card itself is not in fact doing *HARDWARE* RAID ... it's all being done in *SOFTWARE*. So, it's just an expensive 4-port PCI SATA controller with average performance. Other Thoughts: Will avoid this manufacturer in the future, since clearly cannot trust their write-ups here on NewEgg. 4 out of 9 people found this review helpful. Did you? This is a Hardware RAID controller. You need to hit F4 or CTRL-S before booting into your OS to get into the RAID Controller's BIOS. The instructions can be found both in the manual and our website. Once you are in the cards' BIOS, you can set up RAID 0/1/5/10. I hope this helps you. Other Thoughts: Not a high demand item but I needed one. Pros: Looks like it would work well for what I wanted, adding four ports. Cons: It does not want to work with my AMD board and processor, Intel only. The instructions are for windows 2000/XP to give you and idea of how old this unit is. The drivers are not self installing. Pros: Adds extra hard drives when I need them. Cons: It adds about 60 seconds to my boot time because it is spinning up every drive looking for a boot sector. I don't trust the thing to boot an OS, it is just to add a bunch of drives and there is no ability to tell it to shove off until windows boots. Other Thoughts: Not worth the hassle. I am just going to replace two of my hard drives with 5TB drives and give away the old 2TB and smaller drives. We're sorry if you had issues with this SATA card. We would like to verify that you have your BIOS settings to AHCI mode and not IDE mode, which could be causing the boot-up delay as well. Pros: - works fine as a 4-port SATA II expansion card, I guess. Cons: - shows RAID member drives as individual, read/writable volumes to booted OSs (Windows and Ubuntu). - requires drivers to be installed for Windows7x64 to detect drives connected to this card. Other Thoughts: After configuring a RAID1 array in with the card's ... BIOS? And then rebooting to my UEFI, everything looked good - a single drive, with the name I chose for the array, was displayed. But when booting into an OS - Windows7x64 and Ubuntu were tried - the individual drives were displayed along with the RAID1 array. What is the card's plan if an OS writes different data to each drive in its RAID1, and then writes a third piece of data to the RAID1 array? I don't know, but that isn't how RAID is supposed to work. We're sorry to hear that RAID did not work as intended. Based on the information you have given, we are unsure why it resulted in the way it did. We ask that you please contact our support team to assist you by emailing support@sybausa.com, and provide us with more information so that we can help resolve this issue. Pros: Inexpensive RAID5 capable card. Installed with no issues. BIOS came up and RAID5 drive configured. Installed RAID BIOS/Driver from CD in Win7. set up and formatted RAID drive. No issues so far. Just 4 eggs because it lacks management software. Cons: Just a couple minor issues. After establishing a RAID the boot-up screen no longer appears, so I don't know if I will be able to change the RAID. No provision in the card BIOS for a "spinning spare." No management software on the CD. Guess for the price, I shouldn't complain too much. Other Thoughts: It's PCI not PCI e so throughput speed won't be great. And for some reason it only comes with 2 SATA cables, so you need to supply a couple of your own if you want more than 2 drives.